Requirements: Players need to bring a yellow swimming hat and a digital camera. "Lumen" is eye, "venatio" is hunting. 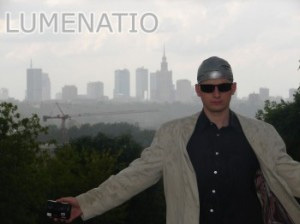 "Lumenatio" is surrealistic photographic game in which players run and hide on the streets, hunting for numbers which are on the back of each others heads. The object of the game is to "Shoot" or photograph as many different Lumenatio Numbers as possible. Lumenatio numbers are the numbers on the players heads. A "shot number" is a number that is clearly visible on the photo. The winning player is the one who collects all or most of them. Players run and hide on the streets, hunting for numbers which are on the back of each others heads. The view is surrealistic, because the numbers are placed on the swimming hats that players have on their heads. During the game you can feel the atmosphere of actions movies, with lots of people shooting each other from behind the corner, running, fighting and hiding, presenting all the different tactics.